Fiction which breathes on the realms of real is a rare work of art. ‘The Bear’ (L’ours) is one such cinematic experience. A moment ago you are seething with worldly chores and the next you are taken for a ride— a ride into the wild! This dream like awakening is as surreal as it is real. To put to words what ‘The Bear’ transfers to the celluloid is a posing task. It enthralls you to the edge of your seat and evokes emotions that you never knew were hibernating deep within in you. The subtle undertone which rides through the course of its essay is improbable to miss. For all the right reasons, the movie was endorsed by both the American Humane Association and the World Wildlife Fund. 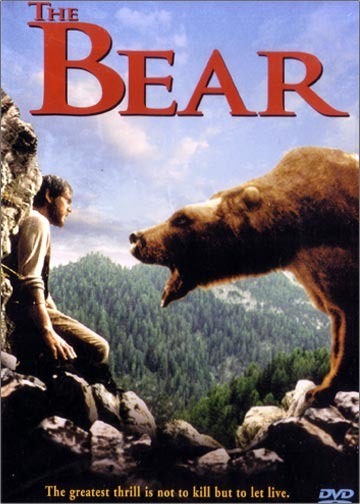 The Bear is based on James Oliver Curwood’s novel The Grizzly King (1916) and tracks the journey of an orphan bear cub (the momma bear’s death paints poignancy all over the screen) who follows an adult male grizzly as they try to escape human hunters. Right from the opening sequence that shows the cub playing with the mother bear to the innocent dreams that the bear envisions…there is the smell of jungle all through it and try as hard as you can, it’s unmistakably present in the movie. Here’s one of my favorite scenes from the movie wherein the asperity of being in the wild is brought to life. The film’s tagline—”The greatest thrill is not to kill but to let live” echoes the sentiment of the hunter/author who turned conservationist. Highly recommended, do watch it! Oooh…i’ve seen this movie…and felt it was absolutely FANtastic! i haven’t seen yet but love to. This seems like an interesting movie… the poster is absolutely endearing! very touching scene.. 8 below is another great movie on animal life ! I hope to catch up with this sometime soon! Thanks for the post and the review. Oh my god. The clip made me cry. Heart breaking. Previous Previous post: How to win friends: woof way!